Chelsea manager Jose Mourinho has been named Barclays Premier League manager of the season for the third time. In his second spell at the club, the Portuguese, 52, guided Chelsea to their first Premier League title in five years and a League Cup success. 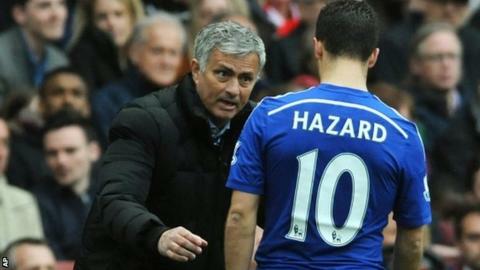 Blues midfielder Eden Hazard, who scored 20 goals for the champions, was named player of the season. It adds to his Professional Footballers' Association and Football Writers' Association awards. Mourinho was also recognised after Chelsea's league triumphs during the 2004-05 and 2005-06 campaigns. He succeeds Tony Pulis, who was named 2013-14 manager of the year after he masterminded Crystal Palace's remarkable escape from relegation. Hazard's team-mates John Terry, Cesc Fabregas and Nemanja Matic were also nominated for the player of the season award, as were Manchester City striker Sergio Aguero, Manchester United goalkeeper David de Gea, Tottenham striker Harry Kane and Arsenal forward Alexis Sanchez.